If you advertise or are thinking about advertising on the radio please heed this warning…. RADIO COMMERCIAL PRODUCTION COUNTS. (This is the script, voice-over, back-round music, theme, sound fx, etc. used in your commercial). I not only say this because I own a production company, but because I want to see my clients and friends who own businesses succeed. Many times the “QUALITY” step in radio commercial production is completely thrown to the wind. Here is the scenario: A hard working business owner will make the decision to advertise on the radio. The owner will put loads of their hard earned cash into an advertising schedule… What is the next step? Creation of a compelling commercial message – A key step in any advertising campaign. However – Many times this step is done with minimal care, or none at all. Either a business will use a radio stations “Free” production services or go to a dirt cheap production house and hope for the best… Not all, but most of the time these “free” or dirt cheap production services tend to be “free” or cheap for a reason. Just as there is a reason the lemon car on the close-out lot is $100. Is it a car – Yes. Will it get you where you need to go – No. The business owner will get their commercial on the air, see little to no results and then come back and say the infamous words “radio didn’t work for me”. When in reality, it was the specific piece of cheap production that didn’t work for them. If a car runs out of gas and leaves you stranded because you didn’t fill it up, you can’t blame car for not taking you from point A to point B. If a business is spending more than one thousand dollars on advertising placement, wouldn’t it make sense to invest the extra couple hundred dollars it costs to put a quality and compelling radio commercial together? If your radio commercial is creative and compelling it will likely yield results, if it is carelessly thrown together from a “free” or dirt cheap commercial-by-the-dozen production service it likely won’t. Even worse, you will have thrown away thousands on advertising time with an in-effective message. 1- Ask questions, communicate, and get to know you and your business. They should find out what You’re goals are for your commercial, and an idea of the over-all feel you would like for the commercial. 2- Be able to provide examples of previous work (hopefully you will be able to recognize some of these samples from casual listening). 3- Be able to provide honest insight and feedback to your questions and suggestions, not just say “YES” to all your questions in order to get you out the door. 4- Be able to show you multiple Positive reviews from past clients, so you know you’re dealing with someone who knows what they are doing. 5- Deliver a quality product in a timely manner. An effective marketing plan starts with an experienced marketing team. If you have any questions about TV Advertising or Radio Advertising call me anytime - (231)468-9972 or email us here. Or visit http://www.bestradiocommercials.com . My company has been one of the most trusted names in Television Advertising and Radio Advertising for years. Ignore your customers, and they will ignore you. Seems like a fairly obvious assumption, but many of us fall into this trap in times of economic turmoil. The reactionary response to lower profits is to cut something, unfortunately one of the first things many of us cut is marketing budgets. While a realistic cutback may be needed, an all out slashing of the very tools that drive customers too our doors is often what occurs. Leaving our presence in the marketplace lacking, as well as an shortage of income. The principle of “brand awareness” does not disappear when the economy hits a rough patch. Customers still need to be constantly reminded of your existence even when times are tough. Whether this is through radio commercials or any form of marketing. Contrary to popular belief, your target customers are still buying things. Maybe less than they were a year ago, but they are still indeed spending money; spending that very money with the businesses that come to the top of their minds first. It’s more important than ever to ask ourselves… “will they think of us first”. Right now may be a great time to gain some footing over your competitors. If your competitors have slashed their marketing, it could be the most opportune time to start showcasing your products and services to a marketplace that is lacking any brand awareness for such an industry. Not only driving more business to you now, but also creating a new and solid customer base that can only grow as the economy slowly rebounds. This leaves you with a much larger share of the market than you had going into the recession. It is important to explore marketing options that are realistic for you and with-in your budget though. You don’t want to stretch yourself to a breaking point. 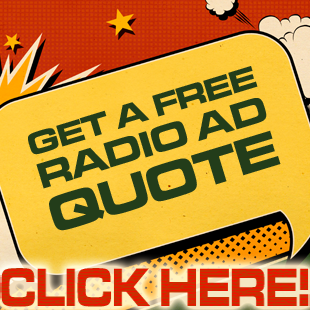 Radio commercials as well as TV commercials are the route to reach the most people at the lowest cost per thousand. Even maintaining a stronger presence with your email mailing list in such a down time will help you keep awareness there with your existing base.